The sun sparkles blue and gold; a warm breeze washes over your body; leaves sway in the summer sun and your mind is free as you roll over a small hill covered in colorful wildflowers. Around the bend, you spot the van and trailer where your gourmet picnic lunch is waiting. The chef and tour leader, Andre, greets you with a warm smile and then you sit down at a small wooden picnic table, lean back and take in the stunning view. It’s only then that you realize you’re perched near the edge of a grand seaside cliff, looking out across a sparkling blue ocean that sweeps off into the distance as far as you can see. Birds soar off thermals created by the land that collides nearby with the sea, and in the distance you spot a school of surfers, waiting to leap into the Atlantic waters with their surfboards ready under their arms. As lunch is served, your taste buds become instantly overjoyed. The food is delicious, and unique, and entirely Portuguese. Local cheeses, sea food, servings of rice and deserts of all kinds are set before you in an exquisite three-course meal. After lunch, you jump back on your bicycle, and continue down the coastline – the rest of your tour group following closely behind. A mix of dirt, gravel and paved roads takes you for several kilometers through an orchard of cork trees, past a giant bed of wildflowers, and along the edge of several scenic beaches, before you eventually make your way to the hotel – a picturesque oasis in the middle of a valley. After being shown to your room, you remove your shoes and place them by the door. The red tile under your feet is cool, but welcoming. It feels like home, only better! After a good, long day in the saddle, the warm shower feels like heaven, and a short nap in your bed makes you feel as though you are floating on a cloud. Later that evening, you make your way to the dining patio, where a fancy feast of foods is laid out before you – one course after the next. While you eat, you chat with your new friends about the day you’ve just had, while the sun sets in the distance and a relaxing wave of warmth and peace washes over you. With your stomach now full and your heart filled with joy after a beautiful day of bicycle touring, you take a walk around the property, smelling the flowers and soaking in the beauty of your surroundings. This past summer, I had the pleasure of participating in the Cruising the Coast guided bike tour with Bike Tours Portugal, and it was seriously one of the most memorable things I did this year. Everything came together on this trip to make it the perfect cycling holiday. The weather was spectacular, the scenery was stupendous, the tour leaders were friendly and knowledgeable, the food was always superb, and the cycling was an absolute joy – from the first day to the last. My experience on the Cruising the Coast guided bike tour with Bike Tours Portugal was nothing short of an A+. What Makes Bike Tours Portugal Unique? Bike Tours Portugal is a high-end bicycle touring company. They specialize in luxury cycling holidays in Portugal and they do a really good job of it. Their services aren’t cheap, but they’re the best at what they do! The tour is supported by a Mercedes Sprinter van and trailer, which is equipped with a kitchen, bathroom, and bike storage/maintenance facilities. If you don’t want to cycle one day, you can ride along in the van. Or if you need to use the restroom during your lunch break, there’s no need to pee on the side of the road. The trailer is equipped with a fully-functional bathroom! While the breakfasts on tour consist of high-end buffets and the dinners are exquisite three-course meals consisting of local dishes and all the seafood you could ask for, the gourmet picnic lunches served throughout the tour are really something unique. No other tour company (that I know of) is serving up such high-end lunches to their clients. You’re going to love stopping for lunch each day! Plus, the staff at Bike Tours Portugal is the best. They are friendly and knowledgeable, but far from stuffy and stuck-up. They are strong cyclists, but won’t turn your bike tour into a race. 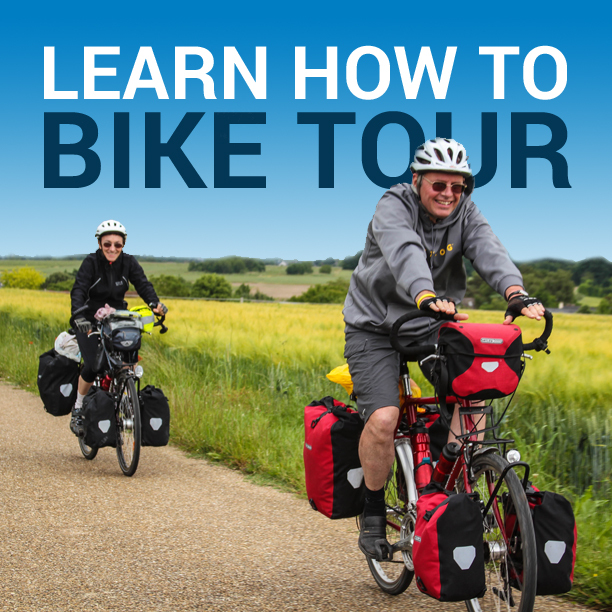 They understand that your time with them is meant to be an enjoyable experience – from start to finish, so they’ve gone out of their way to design a guided bike tour that meets and exceeds your wildest expectations. A day-by-day account of the Cruising the Coast guided bike tour can be found on the official Bike Tours Portugal website, but my extra notes and comments have been added here. In addition, you can watch the entire bike tour unfold, from beginning to end, by viewing the videos below each day’s description. On the first day of the Cruising the Coast guided bike tour, you will be transported from the airport in Lisbon, Portugal to your first accommodation in the nearby fishing village of Sesimbra. It’s an enjoyable 1-hour ride in the van from the airport to the hotel, allowing you to see a little bit of Lisbon before heading to the quaint little seaside village where your hotel is located. The Sesimbra & Spa Hotel is a massive, white, luxury hotel located on the edge of the Atlantic Ocean. From the water, the property looks like a giant cruise ship parked on land. The rooms are big and modern, with spectacular views of the beach and ocean from practically every room. Once you check in, you have the rest of the day to walk along the beach, take a swim in the hotel pool or do anything you please before dinner is served in the hotel restaurant later in the evening. 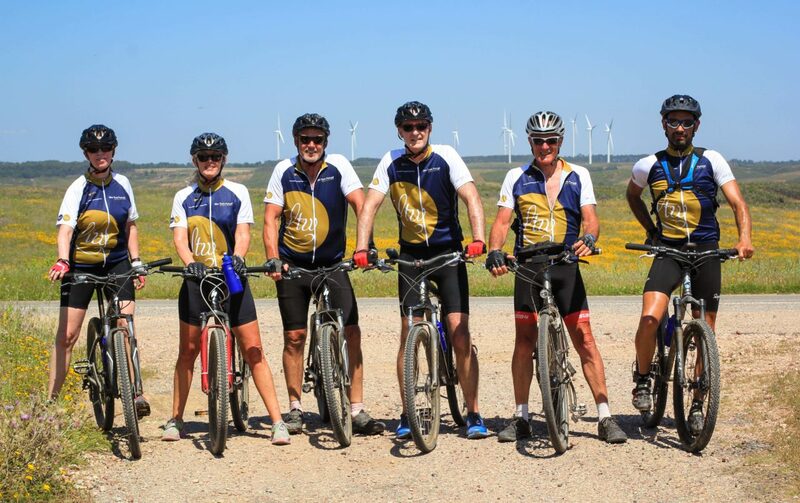 On the second day of your luxury cycling holiday with Bike Tours Portugal, you’ll eat a delicious buffet breakfast in the hotel, before loading your belongings into the tour van and being equipped with your bicycle – provided by the tour company. After a short welcome by the tour leaders, you’ll begin your ride out of town and down the coast. Half-way through the day you’ll stop for the first of your many delicious picnic lunches, and you’ll finish the day by taking a short ferry ride across the water to the Tróia Peninsula and your accommodation for the night, the Tróia Design Hotel. Situated at the very tip of an enormous peninsula of golden sand and pine trees, the Tróia Design Hotel is a large, modern, multi-story hotel equipped with all the luxuries you would expect in any top-tier hotel. The view from your room is spectacular, as you can look out across the water toward the roads that you were cycling on earlier that day. Dinner is served in the hotel restaurant and afterward, you can retire to your room or take a romantic walk on the beach. After another incredible buffet breakfast, you’ll hop on your bicycle and say goodbye to the Tróia Design Hotel. It’s a long, flat, enjoyable ride south down the peninsula, during which you will ride past massive sand dunes and hundreds of small pine trees. From your bicycle, you can see the water on both sides, with nothing but flat, smooth tarmac in front of you for as far as the eye can see. In the tiny town of Comporta, you’ll visit the local winery, where local Alentejo wines can be tasted and the vineyards can be viewed up close and personally. Your gourmet picnic lunch is served at one of Portugal’s most beautiful beaches (Praia do Carvalhal), and as the day draws to a close, the landscape will change from sea cliffs and ocean breezes to wildflowers and fields filled with cork trees. At the Herdade Barradas da Serra, you’ll fall in love with the intimate and inviting accommodations and you’ll have a chance to go hiking on one of the nearby trails or take a swim in their pool. Dinner is served on the patio as you relax and take in the beauty of Portugal’s Alentejo region. Breakfast is served inside (or on the patio) at the Herdade Barradas da Serra. Afterward, you will load your belongings into the van and take off down the road. It’s a long 40 kilometer ride before lunch, but the cycling is some of the best on the entire tour. Small rolling hills covered with trees and wildflowers, gravel roads with very little traffic and some of the best beaches in the world await you on this particular day of cycling. After a seaside picnic lunch, you’ll continue biking down the coastline to the charming village of Porto Côvo. It’s here that you’ll begin your bike tour in the Vicentine Coast Natural Park, where more than 750 plants and 200 species of birds have been identified. Eagles, falcons, fox and linx are also known to live within the area. On this particular night, you’ll be sleeping and dining at the 3 Marias guesthouse – a unique countryside property surrounded by fields of yellow flowers and the occasional wandering donkey and/or ostrich. After a memorable homemade breakfast at the 3 Marias guesthouse, you’ll continue your cycling holiday by biking through the Vicentine Coast Natural Park, which is more than 100 kilometers long and is Portugal’s largest stretch of protected coastline. The ride today is extremely coastal, with lots of opportunities to stop and take photos of Portugal’s most scenic beaches. In addition to having yet another gourmet picnic lunch at a beautiful coastal beach location, you’ll cycle past the Cabo Sardão Lighthouse and dozens of windswept sea cliffs before arriving at the Touril Country House, where grazing donkeys welcome you to your luxury accommodation in the countryside. Sip a lemonade at the bar or take a dip in the saltwater swimming pool. This may be the shortest ride of the entire bike tour (at about 30 total kilometers), but it’s a bike ride that will take you to some of the best beaches in all of Portugal, if not the world. Watch the video below and you’ll see what I mean. After a buffet breakfast at the Touril Country House, you’ll jump on your bicycle and take off down a mix of road surfaces to one scenic beach after the next. A few small hill climbs are rewarded with downhills that will make you smile from ear to ear on the other side. Horses race to the roadside to greet you as you cycle past, and in the small hillside beach town of Odeceixe, you will find accommodation at the Monte do Cardal – a unique lodging option in which large apartments and small Portuguese houses have been transformed into luxury accommodations for guests from all around the world. For dinner tonight, you’ll be taken into the center of town, where you will dine with the locals at a restaurant that specializes in local seafood dishes. On what will be your last day of cycling on the Cruising the Coast guided bike tour, you will begin your day like you did on all the days prior – with a delicious breakfast buffet. Afterward, you’ll begin cycling south toward Portugal’s south-western most point. You’ll enjoy your last gourmet picnic lunch in what might be one of the most spectacular places of all, and then you’ll continue your bike ride south toward the St. Vincent Lighthouse. As you look out across the Atlantic Ocean, try to imagine the Portuguese sailors of the past launching their boats from this location and sailing off into the unknown in search of new and distant worlds. Just a few kilometers of cycling later, you’ll arrive in the city of Sagres, where you will check into the Pousada Sagres, which is a large hotel sitting on top of a magnificent cliff overlooking the giant, blue ocean. As a group, you’ll enjoy one last dinner together before retiring to your room and calling it a night. Finally, on the last day of your luxury cycling holiday with Bike Tours Portugal, you’ll have breakfast in the hotel, pack up all of your belongings, load them into the support van, and then prepare yourself for the long ride back to Lisbon. It takes approximately 3.5 hours to drive from Sagres to Lisbon, but it’s an enjoyable trip, and the time in the car allows you to think back on all the incredible memories you’ve created over the past week. Part of what makes the experience with Bike Tours Portugal so memorable are the unique accommodations that you’ll be staying in throughout the tour. No two places are alike, which makes it fun to arrive at your accommodation each night, not knowing what to expect or what special treasures you might find there once you check into your room. This large, cruise-ship style hotel takes up a vast majority of the beach-side real estate in the tiny town of Sesimbra. Inside, the hotel features a contemporary design, with large rooms and balconies offering spectacular views of the ocean below. The hotel’s restaurant is first-class, with breakfast, lunch and dinner being served there. My favorite part of the hotel is when you take the elevator down to the beach/pool and find yourself in a large tank-like room decorated with a giant mural of undersea life. This impressive, modern hotel in the heart of tiny Tróia stands towering over any other building in the area. It’s bright exterior design looks a bit like white sails flapping in the summer sun, while the hotel’s interior is much darker and calmer – more like the bowels of a giant boat. The hotel staff speaks English, there’s a beautiful little dining room and bar, as well as a whole host of facilities you would expect to find in any modern-day hotel. Inside your room, you’ll find that the bathroom facilities are almost inside the room itself, with only a large glass tank (of sorts) separating the bathroom from the sleeping area. Step out onto the balcony, and you’ll be able to take in some spectacular views of the ocean, sailboats cruising past, and the scenic cliffs that sit far off in the distance. The Herdade Barradas da Serra in Grândola, Portugal was my favorite of any of the places we stayed at during the Cruising the Coast guided bike tour with Bike Tours Portugal. This sleepy little ranch house is situated in middle of a vast valley filled with grass and wild flowers and cork trees. What was very likely once a large ranch-style home has since been transformed into a high-end luxury lifestyle guesthouse in the middle of a tranquil nature resort. The swimming pool, hiking trails, open terrace and free WiFi only add to the overall impressiveness of this unique accommodation in southern Portugal. Situated in the relaxing (and somewhat remote) countryside of Northern Alentejo, the Tres Marias (or 3 Marias) guesthouse welcomes you in from the very start. You roll in on a dirt road surrounded by yellow wildflowers on all sides. Donkeys graze in the distance and an ostrich comes up to the fence as you walk past – wishing you hello. The rooms are white and clean, situated on two different levels, with a small living room on the first floor and the bed/bathroom on the second floor. Surrounded by the Agro-forest Ecological Reserve on all sides, the 3 Marias is a great place to spend the evening (or even a few days) as you explore the local area. I loved their buffet breakfast in the morning! Built in 1825, the Touril Country House is a small, but inviting tourist hotel located along the Vicentine Coast of Portugal. This large, 365-hectare property offers a salt-water pool, free WiFi and accommodations with private verandas. There’s a relaxing poolside bar, a romantic indoor reading room, and a dining area where delicious 3-course meals are served in the evening. Situated in the heart of the hillside town of Odeceixe, the Monte do Cardal is a B&B-style accommodation option for those wishing to explore the beauty and wonder of Portugal’s south-western beaches and nature resorts. Each apartment within Monte do Cardal is unique, with no two apartments featuring the same interior design. While my room at Monte do Cardal was nice, it was nothing to write home about. However, the other couples in my group said that this was their favorite night of lodging on the entire bike tour. Finally, the Pousada Sagres is a large, rectangular hotel situated on the cliffs looking out across the Atlantic Ocean. The building is a little dated, but there’s a large dining room and the views from the rooms at the back of the hotel (facing the water) are to die for. The Pousada Sagres was a great place to end our week-long cycling holiday with Bike Tours Portugal. Bike Tours Portugal has gone out of their way to orchestrate the best bike tour in all of Portugal. The company is organized and on top of everything. The booking process is a total breeze; they have high-end bikes available for you to ride (making it easy for you to simply show up in Portugal and enjoy your cycling holiday); the tour staff is friendly and knowledgeable; the food is absolutely delicious and will give you a taste of what Portuguese cuisine is all about; and the accommodations each night are charming, unique and luxurious. Every part of the tour, from the moment you wake up in the morning to that last second before you lay your head down on your pillow at night, is so incredibly well thought out. I can’t think of even a single negative thing to say about the tour. In the end, this bike tour in south-western Portugal isn’t just another cycling holiday where you cruise down the coast in style. It’s a 250+ kilometer bicycle touring experience you’ll remember for the rest of your life! This entry was posted in Bicycle Touring Pro Articles, Darren Alff's Bike Tour Blog, Featured Articles, Featured How-To Articles, Main Articles, Portugal, Product & Service Reviews, Uncategorized and tagged bike tour review, bike tours portugal, cruising the coast, cruising the coast guided bike tour, cycling holiday, cycling holiday in portugal, guided bike tour, portugal, portugal bike tours, tour review. Monte do Cardal? You mean Casas do Moinho in Odeceixe! Once again, the accommodation in Odeceixe is CASAS DO MOINHO, not Monte do Cardal. This should be corrected in ‘The Accommodations’.